Onions are one of the most essential ingredients for any cook. From soups to stews, they add flavor and enhance the dish, making it more delicious. Onions are one of the easiest vegetables to grow, and they also store very well. 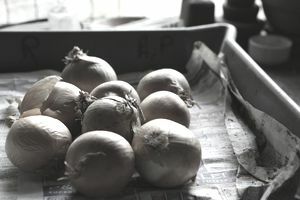 If stored properly, in a cool and dark location, some onions can maintain their flavor and freshness for as long as one year. Learn how to cure your home-grown onions, and you won't need to buy any this winter. What Onions Are Good for Storage? There are two main types of onions: pungent and mild. Mild onions are large and juicy, and are frequently used on hamburgers and sandwiches. Unfortunately, mild onions do not last very long in storage. Under the most ideal conditions, they may keep for one to three months. However, there are ways to preserve them to make them last longer. Use them to make salsa or pickles. Then, freeze or can them to prolong their life; or chop them up, and freeze your raw, chopped onions, so you grab a handful out of the freezer whenever you need them. Pungent onions are very different. Smaller, and less juicy, than mild onions, they are usually the onions that induce tears when you cut them. But good news: those compounds that cause tears to well up, also happen to be the ones that make the onions ideal for long-term storage. Under the right storage conditions, these onions will keep for months and months. Storing onions is very simple. In the summer and into the fall months, your onion tops will start to turn brown and fall over. That's a sign that they're ready for harvest. Pull, or dig, them up on a dry day. Then, follow these steps to cure them before you store them. Place the entire onion plant, including bulbs and leaves, in a cool, dry place. You can hang the onions in bunches, or spread them out on a rack to cure—whichever works best for you. Allow the onions to dry for two to three weeks, or until the tops and necks feel dry to the touch and the outer onion skin is shrunken and papery. Leave the leaves intact, if you plan to braid your onions. Trim them to within an inch of the bulb, if you plan to store your onions loose. Be careful not to cut them too short. This will shorten their storage life. Thick-necked onions do not store well. Neither do wet onion varieties, so be sure to use them first. If you have a lot of either variety, your best bet is to preserve them by freezing them. Don't store your onions near your potatoes. The onions will cause the potatoes to go bad faster; and the potatoes will cause the onions to go bad faster. It's also a good idea to keep your onions away from other fruits and vegetables that might absorb their flavor. Use some of your onions to make your own onion powder and onion salt. This will save you money, and give you another way to store your onions long-term. As long as you dry them properly, they'll keep indefinitely. When you plan next year's garden, seek out onion varieties that are know to store well. These will often be referred to as keeping onions or storage onions in the garden catalogs. Typically dry, pungent onions store best. They're the ones that really make your eyes tear and sting when you cut them. It's the sulfur in the onions that causes this effect, and it's that same sulfur that protects them from rotting. Try to estimate how many onions your family uses in a year. Then, plant accordingly. If you guess right, you may not need to buy any onions from the grocery store. How Can You Keep Certain Foods Fresh for Longer Periods of Time?